The age of the internet has been rough on traditional printed publications. Even major magazines such as People and Time have occasionally struggled as they adapted to the digital age that has more and more people absorbing most of their content digitally. While that ongoing transition has seen the demise of many smaller publications, the magazines that have adapted well, like Wired, are better than ever. There’s another nice perk of the online era when it comes to the magazine world: you can preserve publications and make them available to more people with a scanner and some patience. Case in point: the entire run of Omni magazine is online and readable for free. 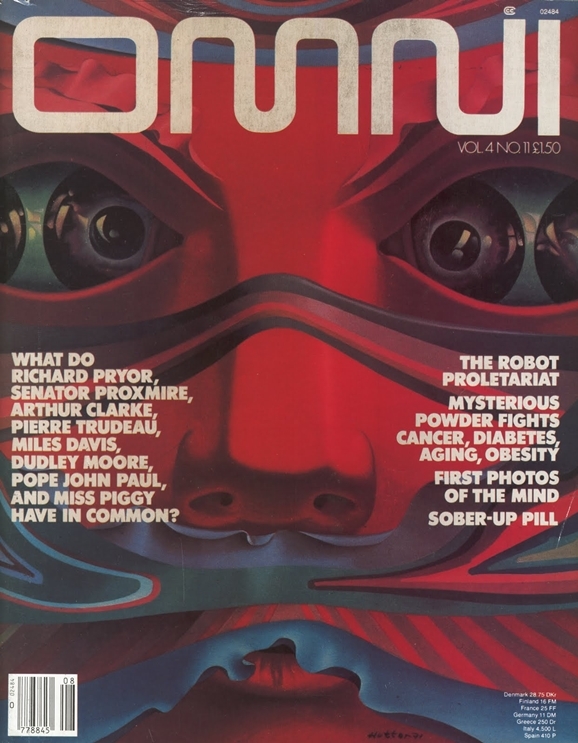 During its long history, Omni featured many who would go on to become notable contributors to science fiction literature, including Ben Bova, who worked as an editor for the mag. Omni also first published many stories that became genre classics, such as Harlan Ellison’s novella, Mephisto in Onyx and William Gibson’s Burning Chrome. It also published genre-leaning stories by more mainstream writers, including William S. Burroughs and Joyce Carol Oates. And are any of the authors being paid for this reprinting of their work? Sounds like a massive rip-off of intellectual property to me. Writers (mere “content providers”) get screwed again, because everyone knows they should provide their hard work for nothing, like slaves! teachers, doctors and lawyers, need to eat too. Christopher, I’m afraid you don’t know what you’re talking about. Professional writers like those who appeared in Omni do no accept flat fees for fiction; usually, first North American or World rights are purchased, and copyright remains with the author. And no electronic rights would have been included in any of the older Omni contracts, so no permissions would extended to online duplication. You may notice that ALL Omni issues with a Harlan Ellison story have already been removed from Internet Archive; Ellison is quick to assert his rights in cases like this, and good for him! Sadly for the writers, each copyright holder must complain in writing before Internet Archive will be rectify this abuse of their copyright; IA presumes it’s okay to rob the writers and keep robbing them, until and unless they take notice. Unless it’s in their contract with the magazine (and 99% of the time, it’s not) authors get paid a flat fee for a short story or novella that they write in a magazine such as that. Often, such magazines will ask for right of first publication. Afterwards, the author is free to sell their story to any other publisher. However, yes, they were paid for their work in the original magazine. A reprinting of the story is a different manner, as these are not reprintings, these are online copies of an already published and out of print magazine. Did it ever occur to you that the writers knew their works were online and they not only alowed it BUT wanted it? Just as the article mentioned, Omni gave breaks to many writers and in its present form will continue to do so. This is probably why the other writers let it be so. Harlan ellison did what he think is right but dont assume that the other writers were ignorant of Omni going online the archive. Not every writer out there wants to be a control freak. Is it going to be in the same horrendous sans serif type as the original? I think Guccione must have thought people were buying Penthouse for the typography, so he inflicted the same heinous stuff on OMNI. i’m just trying to find that numbers puzzle they printed [around ’79-’82] that was related to song titles and poems and such, i.e. 3= “B.M [S.H.T.R.] 3=”Blind Mice [See How They Run]” it was lengthy and challenging…has anyone seen it? Can anyone remember a short story printed in this magazine between 1978-1980 that takes place in a dank and wet cathedral? I remember reading this in my late teens and it still kind of haunts me to this day. The scene in this church was darkness and filth with many levels consisting of loose netting. one of the characters was a depressed and likely demented Jesus Christ. Who was the author? Does anyone know in what issue this story was printed? Were Atlantians a race from Earth that took to space to avoid the Iceage. That their environmentalist forsaw destroying their civilization. With the distance to a different world capable of supporting their needs. Have they returned in what man calls Alien UFO’s as their vehicles? From ancient history we have heard of Dragons. Has man been told of Dinosaurs that flew or Dragons. Does Cosmic Dust cause Friction that heats the outer shell of a spaceship? Yes, I also remember a specific article, it was just one that took part of the page and I have not seen any reference to it anywhere. It announced that scientist were able to find a way to “glue” 2 eggs together so 2 moms could propagate. They had looked a long time to find the correct glue. Were the scientist wrong or was the discovery suppressed? I had a game published in Omni that involved moving matches to create an equation. Is there any possible way to search for it by my name?